The evening will start off with a cocktail and canapé reception. Afterwhich you will have a chance to shop the many exhibitors before the fashion show begins. What you can expect to see on the catwalk is the latest fashions from Maison Hala and House of Fraser, sportswear from Lorna Jane and children’s fashion from Chateau des Enfants, and many more! Make sure you are dressed in your most stylish outfit because there is 10,000 AED from Maison Hala up for grabs for the best dressed person. Every attendee will receive a goodie bag. 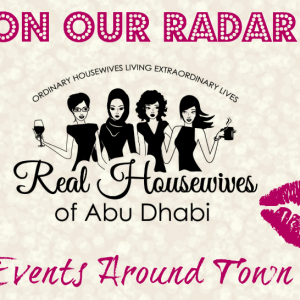 So whether you are fancy yourself a fasionista, or a just regular Housewife (like us) – get your tickets soon. It’s a great way to start the weekend! Please contact 056 353 6136 or info@imageevents.net to purchase your tickets. Get them before it sells out!